The first ten years of the history of the New Orleans Echoes were, as you will see, fairly complicated personnel wise! Come to think of it, so was a lot of the rest of it! All along the line, the dates are a bit hazy too! In 1974, Brian Craig and the late Mark Bradley, who became the leader at the time, formed the band, which was a spin-off from sessions run at the Black Horse, Stansted, Kent, by Owen Bryce, who left to take up a new life on a narrow boat I am told that, at the initial meeting at Mark's house, someone noticed an LP called 'Echoes of New Orleans' and suggested the name 'New Orleans Echoes' for the band. I imagine that this was one of the two records mentioned in Crump and Stagg Included in the line-up of that first band were Mark Bradley (trombone), Brian Craig (trumpet), Sam Rowton (clarinet), Brian Fairbanks (drums), who replaced Pete Reynolds, who had played drums for Owen, Roger Mullen (banjo), Dave Gray (bass), Lynn Trent (vocal), and, shortly afterwards, Phil Dearie (piano), who replaced Malcolm Walton, who had played piano with Owen. Mark recently passed away in Scotland and Brian Craig now lives in Hastings and, though he no longer plays the trumpet, is learning to play banjo. Sam Rowton I never met. 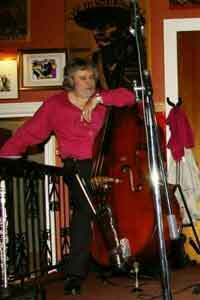 I am told that he was more a dance band style of player and perhaps had no interest in continuing with the band. 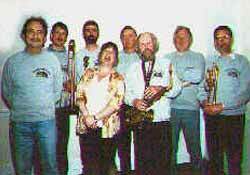 Brian Fairbanks, who stayed with the band also passed away a year or two ago though I spoke to him before then at the Sidcup Jazz Club where he supplied the name Sam Rowton - the spelling of which he was uncertain about. Roger Mullen gave up playing due to ill health a few years ago, retired first to Whitby, and now lives in Tynemouth, his home county! I saw Dave Gray in Bristol a year or two where he has lived ever since he left the band many years ago. I know nothing of the whereabouts of Lynn Trent (her stage name), but I think I heard that Phil Dearie unfortunately died not so long ago A recording made at the Black Horse exists, from shortly after the start of the band, where the line-up has no banjo; the late Norman Halliday is on clarinet, with Colin Martin on piano Another recording made not long after at the same venue includes Ken Colyer on trumpet, the session being a preamble to a concert given, with Ken, somewhere in Sittingbourne, Kent. 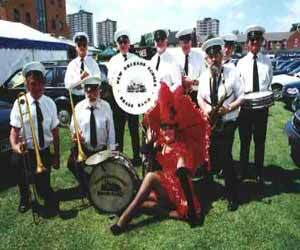 and, when requested to by the Tunbridge Wells Borough Council, I formed, for the first time, a parade band which became known as the New Orleans Echoes Brass Band. New Orleans Echoes Brass Band. With these two set-ups we have played all over the South of England at county shows, corporate functions, and the like. For the last ten years, for instance, we have appeared every year at the Test Match at Edgbaston and hope to do so again this year. Eventually we were again without a home, and Alex Gardiner introduced us to cramped conditions in The Hatch Inn at Coleman's Hatch, on Ashdown Forest, which was to become one of our longest residences. While we were there we also played for a while at The Galipot, just along the road, and were briefly resident twice more under different publicans at The Elephant's Head. It was during that time that we met Penny Payne, who has been a member of the band for more than ten years now. Together we have worked out many arrangements of songs for her, and her emphatic singing and rapport with the audience has become an integral part of what we do. She can be heard on our most recent CD which was recorded live at our current long-running venue, The Haywaggon, Hartfield - also found for us by Alex, who prefers playing in pubs close to home! 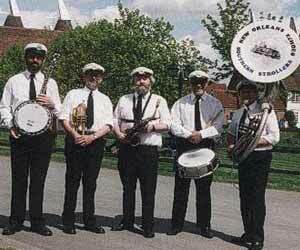 Our repertoire has changed, of course, to accommodate Penny, who likes to sing Bessie Smith numbers and the like, but the overall band policy remains much the same - well, the day may not be quite so 'latter' as it was Also around that time we played for a couple of years at The Chequers, Lamberhurst - very cramped once again, in the bar. It was there that we had the first of our Christmas parties for the band and friends, which continue to this day, though we now hold them at Philpot's Manor, Hildenborough. Round about then we also played, as a five-piece with Penny singing, for the Sunday lunchtime diners at the High Rocks Inn, Tunbridge Wells. 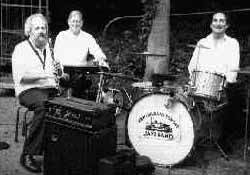 There, we often used the late Chris Gibb on double bass when JR was not available Through the years we have had two more residencies at The Elephant's Head, Hook Green, each under a new publican, of course. The first time, the pub had already been largely converted from its original 'spit-and-sawdust', barn-like image that we remembered, into a modern restaurant set-up. A mini-grand piano took up most of our playing space, and we (the full band including Penny) were crammed together in front of the french windows, which were not there in the old days. Nice to have a good piano, but very cramped just the same. It lasted for a while, but then the publican moved on, as they do. Much the same happened a number of years later when we were asked to play there again. This time, though, the piano was gone (with it's owner, the previous publican, I presume) and we were only a four- or five-piece band with guests. Less cramped and quite successful while it lasted Eventually, for various reasons, Roger Ely decided to give up playing for a period of time and asked 'Mole' Benn to take over from him. My old friend Andy Maynard played banjo for us for quite a number of years until he gave up playing altogether for a time to renovate his house (I think it's finished now), and at one time, briefly, because of carpal tunnel problems. 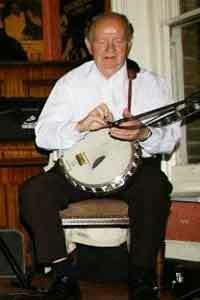 Then, for a while, Eric Webster occupied the banjo seat. 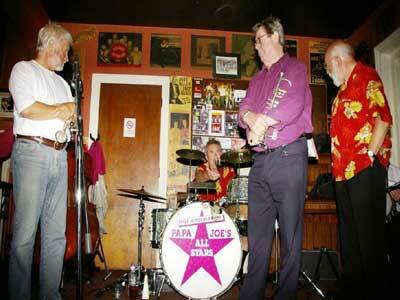 Eventually Andy returned and stayed with us until, a while back, he joined the Delta Jazz Band. Recently, Phil Durell was our banjo player then Brian Masters and Tony Cardwell was back with us for for a while the Jazz Club circuit So, over these many years we have mostly played our local venues and concentrated on commercial work, weddings, fetes, corporate entertainment, etc, making only infrequent club appearances at such places as The Woodman, The 1066 Club, Farnborough, and The Tunbridge Wells Jazz Club. There, we had the distinction of playing with Bruce Turner, who expressed his well-known dislike of banjos until he heard Andy Maynard play. 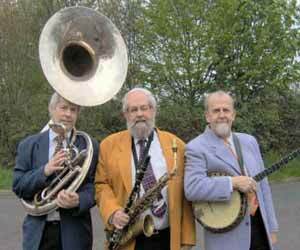 Then as a result of our appearance at the Bexhill Jazz. Festival, we were invited to play at Colchester Jazz Club and I decided on a change of policy toward more jazz club playing. Since then we have appeared at many of the clubs in the South East.